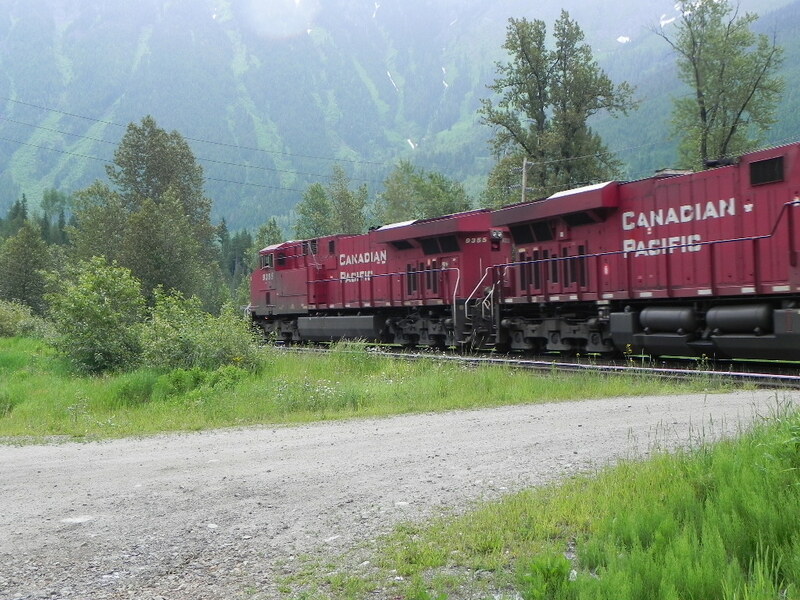 And how could I not show at least one clean, hard working Canadian Pacific train, with the Selkirk’s looming high in the sky in the background, as it attacked the grade up to Glacier and then to Rogers Pass. As you can see though, this is not the rocky cliff side view of the travel posters but rather a wide treed meadow that’s the exception to the rule. This ancient flood plane of the once sprawling Illecillewaet Glacier is now a triangle shaped wedge of rich farmland cut buy a small rushing stream and a popular hot springs conveniently located right next to the railway and the Trans Canada Highway. In days gone by the CPR would stop here for a short while and travelers could get off, breath in the clean fresh air and marvel at the wild, white water. Pushers would snuggle up at the rear and other helpers would latch on up front and prepare for the climb ahead. The gravel road seen here lead from the hot springs at the left to the homesteads across the track and away on the right. The same road branched off to the right, immediately behind the photographer, and lead to the station platform. If you plan to spend some time here yourself book ahead in the early to mid summer. In late August and early September the kids are back to school and there are rustic but well equipped cabins available at trackside. When I stayed, breakfast was free if you were a guest, lunch was inexpensive soup and a sandwich, dinner was best about 20 minutes down the road in Revelstoke.